Lines from writer Joan Didion. "I have already lost touch with a couple of people I used to be." "I am what I am. To look for reasons is beside the point." "The impulse to write things down is a peculiarly compulsive one, inexplicable to those who do not share it, useful only accidentally, only secondarily, in the way that any compulsion tries to justify itself." “I write entirely to find out what I'm thinking, what I'm looking at, what I see and what it means. " "Hemingway was really early. I probably started reading him when I was just eleven or twelve. There was just something magnetic to me in the arrangement of those sentences. Because they were so simple - or rather they appeared to be so simple, but they weren't." "Grammar is a piano I play by ear." “...quite simply, I was in love with New York. I do not mean “love” in any colloquial way, I mean that I was in love with the city, the way you love the first person who ever touches you and you never love anyone quite that way again." I really really love these posts. Any recommendations on where to start with reading her work? 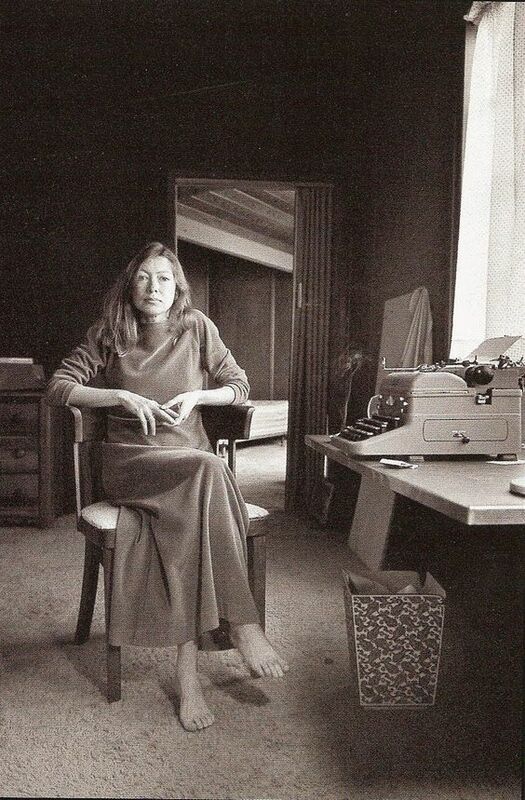 I first read Didion in various anthologies during college -- so these were essays plucked from (or published elsewhere & then corralled in) "Slouching Toward Bethlehem" and "The White Album" and "Play it Like it Lays" and "Blue Nights." And then I have gone back & begun to read the works in these forms. To be completely honest, my overall understanding of her arc from era to era & collection to collection is loose, in part because I didn't read them chronologically. But I also quite enjoy reading a writer's work in whatever organic order I come to find the pieces in. So I say, read the flap copy or summary & go with whatever seems most appealing to you! Didion is such an essential writer, such an essential woman writer, such an essential woman essay writer, so you can't go wrong. Also, "The Year of Magical Thinking" is the story of her husband's sudden death & the year that followed. She tells the story so straightforwardly without any posturing or overreaching -- which, I think is the only way it really could be told. It's such a profound example of her own words "I write entirely to find out what I'm thinking." I just can't read that book without imagining her sitting down and writing it. And I feel like sometimes we lose that in books that feel so...complete or overly refined. This one felt to me like she was grappling with something she knew she could never possibly reconcile. I have a lot of anxiety around that subject, and so this book was really resonant, if totally heartbreaking, to me. SORRY FOR THE NOVEL! Hope that helps in some circuitous way? I love the compilation of her quotes in this post! She is one of my absolute faves. There are a few of her works I haven't read yet.. thanks for the reminder ;) Heading out to get one now..